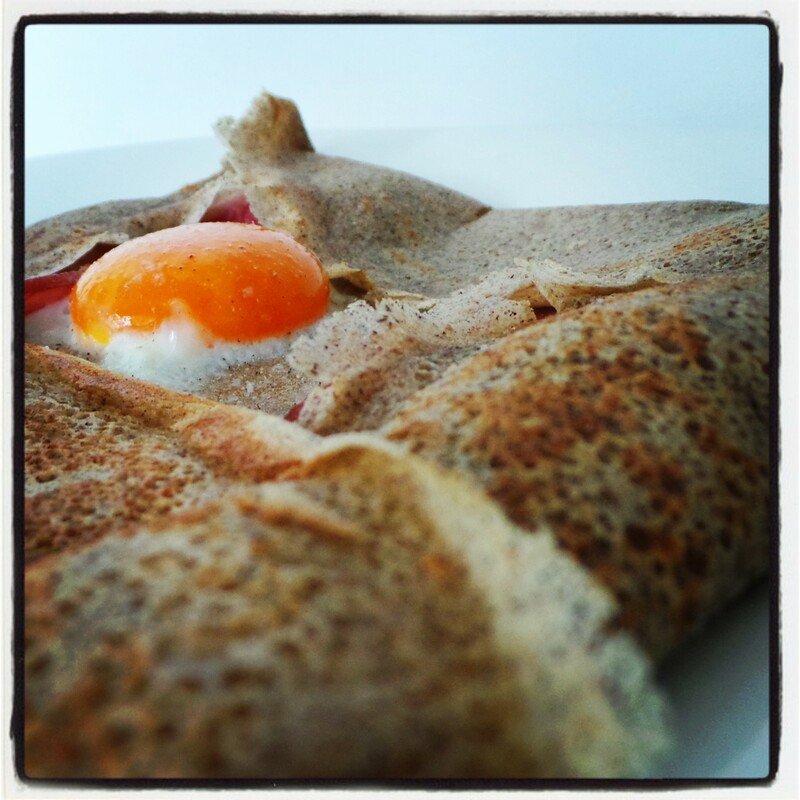 Galettes with Ham and Egg (galettes jambon oeuf) – Food from Home blog! "What I love about food, great flavours beautiful colours and recipes that work"
Faced with the dilemma of what to do with the leftover ham from Christmas and always looking for new ways to present Ham & Eggs at breakfast, brunch or for light lunch! Ive made muffins, toasted sandwiches, Ive scrambled, poached and fried I even made a mini quiche….but what next? “My little Paris Kitchen” had the answer I’d been looking for, I watched an episode where a lovely crape was being made at an out door growers market. The galette was filled with either sweet or savoury fillings. Totally intrigued, I embarked on whipping up a batch. Now you can make these with Buckwheat flour only (as long as you make the batter the day before you need to use it) but at 6.00am in the morning I could only work with what I had in the pantry Spelt Flour and the tiniest amount of Buckwheat flour. *The batter itself is thin and runny so don’t worry, we are so familiar with the thick batter thats needed for pancakes, galettes/ crepes are quite the opposite. *You do need to work fast spreading the galette around the base of the hot pan. *If you pour to much batter into the pan don’t stress, cover the pan with batter and pour the excess out (into the bowl as you will use it to make the next crepe) don’t through it away! Batter: Place flour, salt and the water in a large mixing bowl. Whisk batter until a smooth batter is formed similar to cream. Rest at room temperature for 1 hours. Heat a large crepe pan or frypan over high heat. Brush with a little butter. Pour in just enough batter to cover the pan, and rotate quickly using a circular motion to create a thin galette. When the edges of the crepe begin to peal away from the edge flip the crepe over. Reduce heat to medium and crack an egg into pan, then spread the egg white across the surface of the galette. Top with a piece of ham, and scatter evenly with cheese. Cook for 2 minutes. Fold the four edges towards the middle of the galette, making an envelope shape. Transfer to a serving platter. Brush with extra butter and serve. Repeat with remaining batter, eggs and ham. Artful is the new Rustic!